So very wrong. I realize these are the product of a bygone era, but an innuendo such as this is timeless … somebody must have (or should have) felt some trepidation lettering this thing up given the pose. Well, naturally I cropped it to make it seem worse than it is. The Black Rat is running away into a trap door, so it’s like it’s a rat-hole or bolt-hole. But I cropped out the bottom part of the panel (it’s a circle) so you don’t see that. Because I’m immature. Does this mean Bulletman’s finally about to end crime in his city, and take down the Big Cheese? is that what there calling it now? I figured as much, but a line like that transcends context. It’s like asking a class to take their seats or saying, “I didn’t come here to be insulted.” You know these things are going to merit smart mouth responses. Perhaps I’m wrong and the ’40’s were really a much more innocent era and the inker would have been all aghast and red faced at my crass suggestion of such a thing. Then again, my immaturity would warrant de-monocling on some level. Late night postings are probably the strangest. 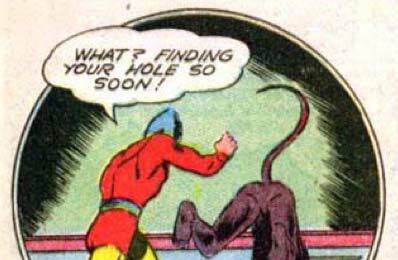 So is Black Rat the giant, mutated result of that experiment Bulletman was doing in the RP a while back?